Thanks to its 5.4L Hemi V8, the 1955 Chrysler 300C was the first mass-produced American car to have over 300-hp. Cadillac also offered a 5.4L V8 in 1955, but it could only manage 270-hp. Fast forward to 2008, and the freshly minted Cadillac CTS offered a 3.6L VVT V6 that pumped out and incredible 304-hp. That was four whole Shetland pony's more than the old Hemi-powered Mopar, and it wasn't even Cadillac's fire-spitting performance model (i.e. Cadillac CTS-V). Now one might argue that the contemporary Chrysler 300C produced more than 304 horsepower from its 5.7L Hemi V8. But the direct injected Cadillac 3.6L LLT V6 was one of the first naturally-aspirated American V6 engines to crack the 300 hp mark. It would be years before the Chrysler 3.6L Pentastar V6 could compete, so the 2008-2011 Cadillac CTS 3.6L was for a time, the most powerful V6 American luxury sedan. And thanks to the AIRAID 253-252C Cadillac CTS cold air intake system, you can increase the power of your Cadilac 3.6L LY7 or Cadillac 3.6L LLT even further. Thanks to modern technological advances, the Cadillac 3.6L V6 is able to create V-8 power from a relatively small package. This happens because the fuel and air mixture is able to be compressed in such a way that more power can be created from a relatively small amount fuel. 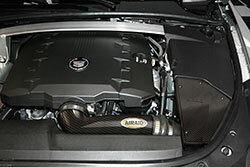 An AIRAID Cadillac CTS cold air intake system is able to maximize the power output by increasing the amount of oxygen-rich cold air that reaches the cylinders. Under normal circumstances, the OE intake system pulls in air from outside the engine compartment via a plastic air box located near the radiator. Before air can reach the engine however, it must first get extruded through a thick paper air filter to remove any contaminants. In theory, this will prevent engine damage and make that Cadillac 3.6L V6 operate more efficiently. Except, all of the dirt that the OE 2008-2011 Cadillac CTS 3.6L air filter removes, builds up between the paper creases (hence the term 'surface loading' filter) and blocks airflow. Not only does this limit the amount of oxygen that will ultimately reach the combustion chambers. It causes the air that does make it through, to slow down and heat up. Cold air on the other hand, has more oxygen molecules than warm air, and velocity allows more air to get compressed into the cylinders. So pumping lots of cold air into the motor will cause the fuel to burn hotter, which yields more horsepower, more torque, and much faster throttle response. 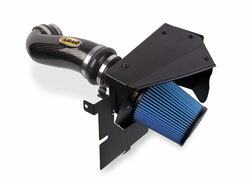 To do this, the AIRAID 253-252C cold air dam intake system swaps out the factory air box and paper air filter, with a big blue AIRAID SynthaMax high-flow performance air filter. This washable synthetic air filter is made from two different layers of polyester. The outer layer of needlefelt polyester is designed to capture larger contaminants without reducing airflow. The second layer of denser wet-laid/chemical bonded rayon and polyester stops the finer dirt particles, so you get maximum filtration, without creating restrictions. These Cadillac CTS performance air filters are considered 'depth loading', because the dirt gets stored inside the filter material, instead of on the surface. This allows a much higher volume of air to enter the system, and the special AIRAID cold air dam isolates the high-flow filter from the hot air inside the engine bay. Once the clean air has passed through the filter, it enters a low restriction polyethylene intake tube. A unique molding process causes the tube to funnel air to the motor at a higher velocity than the narrow OE intake tube, and the wide-angle curves virtually eliminate air turbulence. All of these features combine to yield more horsepower and torque, and a more immediate response from the gas pedal. An AIRAID 253-252C cold air dam intake will also reduce your maintenance cost, because that big 360-degree AIRAID SynthaMax air filter won't have to be cleaned for up to 50,000 miles (depending on road conditions).